Acidotechna® Ltd. offers its customers a complete range of corrosion prevention of building structures and technological equipment and a wide range of jointless industrial floor systems. The company started its activity already in the year 1946, when under the name Acidotechna the first company dealing with corrosion prevention esp. in chemical industry started its activity. After the year 1948 the company was nationalized, transferred to the building industry sector and extended its activities as a sole supplier to all sectors of the national economy. 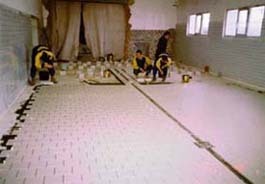 In that time the basic classic technology used in corrosion prevention of building structures and technological equipment was ceramic tiling and lining, using bedding and jointing cements based on inorganic ( water glass) or organic ( phenolic and furane resins) bonds. At the same time a research and testing laboratory has been established, which continues its activity up to now. 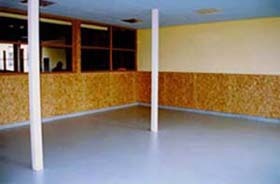 Already in the sixties extended the company its portfolio not only to new types of cements ( based on polyester and epoxy resins) but also on new preventive systems like jointless floors and trowelled or laminated coatings. After the fall of the national enterprise in 1992 a new private company Acidotechna Ltd. was established and most of the experts and technicians as well as the know-how, technological equipment and laboratories were taken over to the new private company Acidotechna Ltd.